The QuickTime Properties panel is displayed when you select (click on) a QuickTime movie (.mov) inserted in your page. It corresponds to the <quicktime> tag in the Tag Selector. In the Element ID text box (displayed in Simple view) enter the value for the id attribute. It will uniquely identify the element (QuickTime movie) in page. In the W text box (displayed in Simple view) you can enter a new width (in pixels) for the QuickTime movie. In the H text box (displayed in Simple view) you can enter a new height (in pixels) for the QuickTime movie. Click the Play button (displayed in both Simple and Advanced view) when you want the movie to start playing. Its label will then turn to Stop. By clicking the Stop button, the QuickTime movie will cease playing. The File text box (displayed in Simple view) displays the path on the remote server of the currently selected QuickTime movie. If you want to replace the selection with another movie, click the button next to the text box and browse to another file. You can also manually change the path and make it point to a new QuickTime movie. With the Alternate Image text box (displayed in Simple view) you can set an image to be displayed in the browsers that do not have support for playing QuickTime movies. You can either enter the full path (URL) to the image previously uploaded on the remote server or you can click the Browse for File button to select an image from the server. By clicking the Advanced button (displayed in Simple view), the QuickTime Properties panel will switch to Advanced view. You will be offered the possibility of setting advanced options for the currently selected QuickTime movie. If the Loop option (displayed in Advanced view) is checked, the QuickTime movie will play continuously. Else, it will only play once and then stop. If the Autoplay option (displayed in Advanced view) is checked, the QuickTime movie will automatically start playing when the page is loaded. In the H Space text box (displayed in Advanced view) specify the horizontal distance (in pixels) between the QuickTime movie and the other page elements (images, table borders, text) to its left and right. These other page elements can be present in page or can be added at a later time: they will not get closer to the QuickTime movie than the horizontal space set. The default value is 0 (zero). In the V Space text box (displayed in Advanced view) specify the vertical distance (in pixels) between the QuickTime movie and the other page elements (images, table borders, text) above and below it. These other page elements can be present in page or can be added at a later time: they will not get closer to the QuickTime movie than the vertical space set. The default value is 0 (zero). If the Controller option (displayed in Advanced view) is checked, the controller bar of the QuickTime movie will show. Else, it will be hidden. 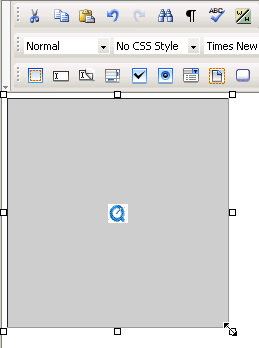 Exact fit - The QuickTime movie fits in the specified rectangle (width x height). It does not preserve original aspect ratio. Aspect - It preserves the original aspect ratio of the movie when playing. With the Bg Color text box (displayed in Advanced view) you can set the desired background color for the selected QuickTime movie. The color will also show when the movie is not playing. By clicking the Simple button (displayed in Advanced view), the QuickTime Properties panel will switch to Simple view. You will be offered the possibility of setting various options for the currently selected QuickTime movie.